Although it's not possible to get a litter that is completely track free, you're going to search forever. However, the best non tracking cat litter can severely reduce the amount of litter your cat drags out of their litter box each time they use it. Our buying guide will tell you why you want to pick a litter that doesn't track as well as what to keep an eye out for, and we've also picked out the five best litter types and brands and reviewed them to allow you to compare them. If your litter tracks, it simply means that it sticks to your cat's feet when they leave their litter box and goes around your home wherever your cat goes until it transfers off their feet. Finding a litter that doesn't track at all isn't going to be possible, but you can find one that minimizes how much it sticks to your cat's feet. In turn, you should notice that there is less litter overall around your house, even if you have a multiple cat household. Typically, most litter that doesn't track clumps together after your cat uses it, and it stops from sticking to your cat's feet due to this clumping. Cleanliness - One of the main reasons that people get this type of litter is for the cleanliness factor because your cat won't drag it all around the house when they walk through their litter box. It'll help to keep your cat's waste in the litter box, and this is more hygienic as well. Economical - Non-tracking litters tend to last longer than litters that have a higher amount of dust and smaller particles. This is more economical because you won't have to replace it as often, and you can buy in bulk. Odor Control - Thankfully, most litter that tracks less is also better at helping to control and eliminate unpleasant odors. Get a litter that works to absorb the odors instead of just masking them because any strong scents can turn your cat away. Scooping - Your cat litter should absorb into the litter to make it faster and easier to scoop. Litter that clumps are easier to clean, and it usually works very well to help lock in those odors that can linger around after your cat uses their litter box. Training - You want to entice your kitten to use the litter box, and they'll be more willing to keep using it if the litter doesn't hurt their feet, smells pleasant, and doesn't stick to them when they go in and out. Now that you know why you need a litter that doesn't track, we're going outline several things that you have to consider when you start looking for different litter. This will help you narrow your choices down right from the start of the search. Most cat litters come with a clay base, and other cat litters come with a newspaper base. Clay is more popular, but newspaper doesn't have the dust associated with it. Paper won't clump if it gets wet, and paper also won't control odors as well as clay will. Some cat litters clump when they come into contact with any type of moisture, and other litters simply let the moisture sift through to the bottom of the litter tray without clumping. Clumping litters are usually slightly more expensive, but they're also easier to clean. As we said, it's going to be impossible to find a cat litter that is completely free of dust, but you can find a cat litter that has less dust than others. You want to find a litter that is up to 99-percent dust free, and you could even get one that you can flush down the toilet when you clean it. The size of your litter's granules and the weight of them make all of the difference in the world when it comes to tracking. Your granules should be larger and heavier, and this makes them less likely to stick to your cat's paws when they leave the litter box. If someone in your home is sensitive to dust, or maybe your cat themselves are sensitive to dust, getting a hypoallergenic cat litter is essential. Your cat will be more likely to want to use it, and it won't irritate allergies for either one of you when it goes into the air. It's essential that your cat litter is able to trap and lock odors in for a few days. Clumping litters are usually better for odor control when it comes to clumping or non-clumping, and your litter can also have things like baking soda added in to help neutralize odors. You may be tempted to buy a litter that comes with a floral scent to help mask odors, but this can be nauseatingly strong to both anyone in your house and your cat. It's better to look for a litter that has no scent at all or that has a very little scent associated with it. You can get smooth litter, jagged litter, and litter that features dust-like granules, and each texture will feel different to your cat. It's important that you take your cat's preferences into consideration when you're shopping for a litter because they won't be in a hurry to use the litter if it hurts their feet to do so. This low tracking cat litter by Dr. Elsey is hypo-allergenic, and it contains no deodorants, perfumes, or plant proteins. It clumps to help prevent sticking to your cat's feet as they leave the litter box, and it prevents moisture from reaching the bottom of the box. 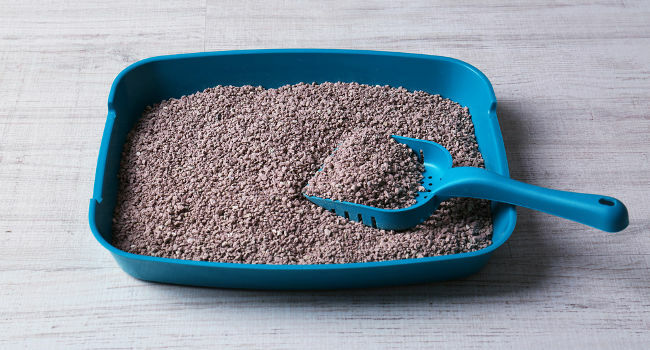 The granules that make up this cat litter are larger and more weighted to prevent tracking as your cat comes and goes. It's almost a dust-free formula, and this prevents a mess when you dump it into the litter box or shift it around when you clean it or change it. The litter forms very hard clumps that lock in moisture and odors, and it's the ideal litter for mechanical or sifting litter boxes. You'll never have to worry about dust, a mess, or problems with smells when you use this litter box in a single or multi-cat household. Cat parents who bought this litter liked that it has very low dust, is hypo-allergenic, and that it doesn't contain any plant proteins. Cat parents did say that this litter did say that the price of this particular brand has more than doubled recently. Arm and Hammer's litter comes in six different sizes ranging from a smaller 14 pound box up to a large 114 pound box that allows you to tailor your order to your cat. It comes with an exclusive guarantee to destroy odors in and around the litter box in seven days. The larger particles with this litter create a weighted litter with very low dust, and this makes it less likely to track around your home. It's designed to seal in odors by clumping up tightly when your cat uses the litter box, and this also prevents it from sticking. The baking soda that comes in this litter is the key to destroying the odors, and it works well for both single and multiple cat households. It comes with a slightly floral scent that helps to remove any unpleasant odors as well. People who bought this litter for their multiple cat households liked that it came with a guarantee to destroy odors within as little as seven days. People who bought this litter for their cat did mention that the floral scent can be very strong for a few hours. 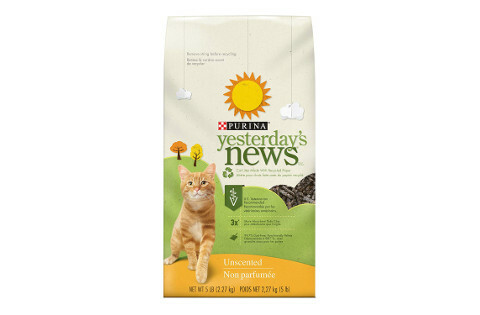 This paper-based litter from Purina Yesterday's News comes with large pellets, and it can absorb up to three times the moisture as normal litter that has a clay base can. This litter doesn't have any added fragrances, it works to absorb odors. Since there are no small particles or dust with this formula, the chances of your cat tracking it through the house are very low. The wet paper pallets clump together when moisture hits them to make cleanup a fast and easy process, even with multiple cats in the house. This litter comes completely made out of recycled paper, and this makes it a green alternative that is safe to dispose of it in the garbage because it'll deteriorate by itself. It's also designed to be very gentle on your cat's paws, and it won't irritate them when your cat walks or digs in this litter. Cat parents who bought this litter for their cats liked that the larger paper pellets could hold up to three times more moisture than traditional litter. Cat parents did note that the urine smell does come through if you don't remove all of the wet or damp pieces. 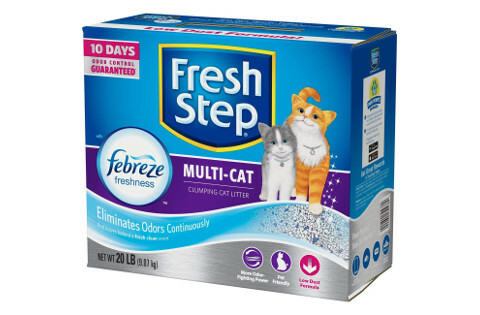 Fresh Step's cat litter comes with charcoal pieces mixed in with the litter that works to guarantee at 10 day odor control from the first day that your cat uses it. It has a light scent of Febreze that helps to cover any odors and leave a clean scent. The larger particles combined with the dust-free formula help to ensure that your cat doesn't track this litter around the house after they use the litter box. You can pick from a 20 or 34-pound box, and this makes it easy to tailor your order to how many cats you have. The litter has clump lock technology that seals any moisture or odors into one solid clump that is easy to scoop out of the litter box and dispose of. This little works well with both single cats and multiple cats in the same household. Cat parents were impressed that this cat litter could work to trap and lock odors in for 10 days because of this reduced cleaning times. Cat parents did say that Fresh Step's litter comes with inconvenient packaging that makes it very easy to spill once you open it. Cat's Pride comes in eight different size options, and it features a newly redesigned formula that is over 50-percent lighter than the original formula. 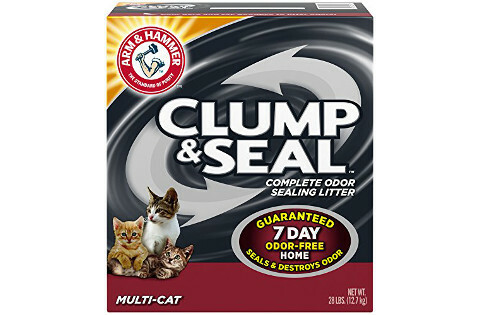 This litter is formulated to work on multiple cat households, and it offers great odor control with a clumping formula. One application of this cat litter is supposed to last for 35 days or up to 140 clumps with minimal maintenance except routine scooping. The litter features slightly larger granules that weight more to prevent tracking as your cat exits the litter box after using it. This litter comes in a secure jug with a twist lid that keeps the litter fresh, and it also reduces the risks of spilling it when you swap it out. It comes with a 99-percent dust free formula that makes it easier to clean and for your cats to use without making a mess. 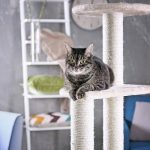 Cat owners who bought Cat's Pride for their pets liked that it has a newly redesigned formula that is much lighter than the original formula while still reducing tracking. Cat owners who bought this litter did say that it tends to stick to the bottom of the litter pan. What's The Best Non Tracking Cat Litter? 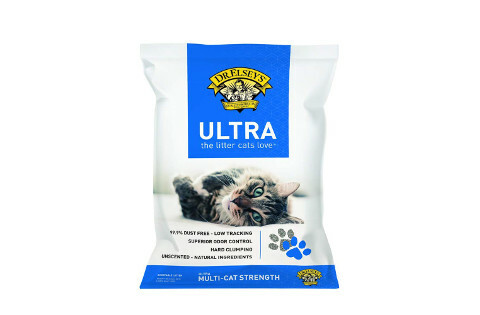 Our pick for the best cat litter that won't track is Dr. Elsey's Cat Ultra Premium Clumping Cat Litter because it contains no perfume, plant protein, or deodorants that can have a strong scent. The litter itself contains larger and heavier pieces that help to reduce the amount of tracking and mess. When your cat uses this litter, it forms had clumps that seal in odors to help keep the area around the litter box smelling clean. Finally, it's great for both single and multiple cat household.